Pump type is a piston dosing pump with manual struck length adjustment with motor 3 phase 220 AC volt delta connection variable speed. We control it with a GK3000-2S0007 1 hp variable frequency drive (VFD) single phase 220 VAC to three phase output. We control the dose of the pump through the VFD with analog reference signal 4-20 mA which effect the frequency (V/F) which change the motor speed rpm. The problem is at low required dosing rate=low ref. analog signal and low frequency doesn't give the required pressure. So, if there is any setting which give us constant volt (220v AC) with different and variable speed? My understanding of a positive displacement pump is that the flow is controlled by the pump speed and is independent of the pressure. The pump will provide whatever pressure is required to achieve the flow rate. (Of course this is in an ideal situation). If you are not achieving the pressure required there may be a mechanical issue with the pump. The seals may need replacing, the pressure relief valve may be set too low or the pump may be inappropriate for the application. So I am not sure the problem is with the VFD. Do a series of tests of variable frequency drive %output (frequency) to pressure. Make a table with a simple calculation for piecewise linearization to program into your PLC. You should use pressure feedback to a PID control loop if you need high accuracy. 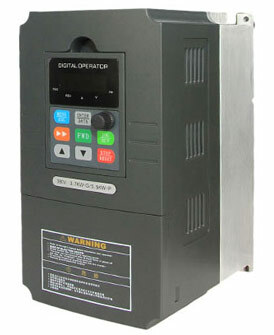 Many VFDs have a built-in PLC which is useful for simple applications requiring feedback control. You will see that drawing a graph of this piecewise linearization that it is very non-linear. There are several reasons for this, but if the viscosity doesn't vary much the problem is solved regardless of the reasons. It is important that the VFD drive settings are matched to your motor so that the protection works. This should provide a signal back to your PLC showing that the motor current is within limits for an alarm. Often it is easier to control the VFD via Modbus than via a 4-20mA because then you get access to all the variable frequency drive parameters for alarms, etc. Try increasing the stroke length for the low flows. The internal leakage of the check valves during the time the valves are re-seating after a stroke may be too close to the amount of fluid you are trying to deliver. A longer stroke will require an even slower motor speed, but the solution to maintaining motor speed at the lower setpoint is well documented above. I have operated constant torque loads down to 4 Hz with adequate speed regulation & control. The torque required by the load must be much smaller than the motor/drive rating, which is usually the case. If your speed is less, then consider going to a slower motor, such as a 6 pole or 8 pole, so the motor frequency is higher for a given shaft speed. The motor design/torque capability is better suited for the slower speed.